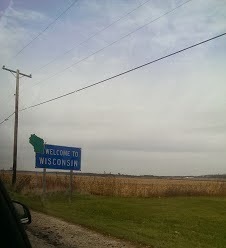 I spent last weekend in Wisconsin for the BYU game and I was surprised at how much I loved the state! I've never spent any time in Wisconsin but it has so much to offer! Before we get to Wisconsin though, I flew into Chicago and grabbed a bite of Giordano's pizza which was amazing! It was high on the list of things people said I HAD to do with my moment in Chicago. Is wasn't long, after a quick rest, that we were on our way to Wisconsin! This SUPER old "pinball" machine had be captivated and I'm so happy that I found an old potato chip container that lists them as "a healthy food". On we went toward Madison and I HAD to find a cheese factory. On to Google I went searching for a nearby "cheese factory". I found one on our route. It was called The Cheese Place and the website was wisconsincheese.com. With an address like that I figured it would be a huge factory with cows and a tour where they showed you the WHOLE cheese making process. After searching the area for the giant factory I realized we were looking for the little cow shack. We laughed until we were crying about this little shack we looked so hard for! And incase you wanted some at home, their sign clearly states, "We Shipping"... how convenient! We made it to Madison and found our hotel. It was an awesome down to drive through. Very lively downtown area that surrounds the university. After the BYU team fireside which was AMAZING, we headed to grab some Potbelly's which I'm sad to say doesn't exist in Utah, and headed to bed. Gameday is always a fun time for me. There is so much excitement and I'm fairly sure my nerves are worse that Mike's. I get a bit anxious for away games about getting to the stadium, finding our seats, etc. Friends since the first day of freshman year, she came to meet me at the game! Love her and her awesome husband! The game was too fun. While we didn't have the outcome we were hoping for, we still had a blast experiencing a game at Wisconsin. There is a reason they have been voted the #1 college football town. They all come out and make it a party!